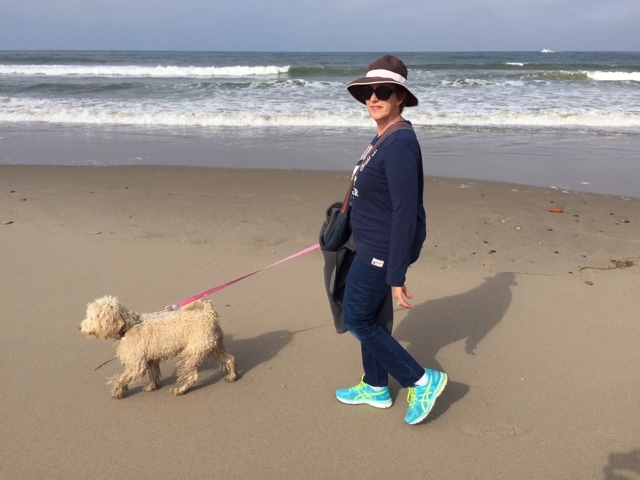 Last week we took Martha Stewart on her first road trip. 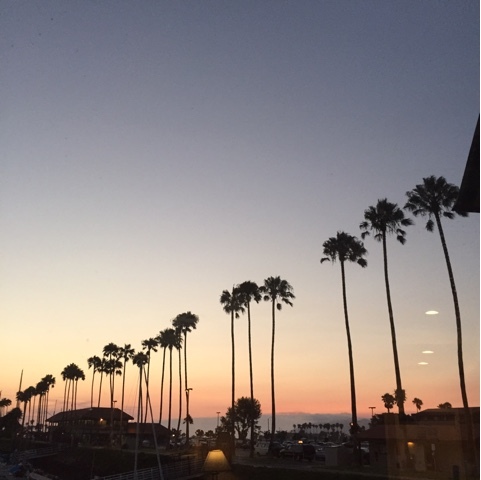 We didn't go far, just a few hours drive north to Ventura, California, where we visited with old friends. I have been friends with Steve since we were three and 9 years old. 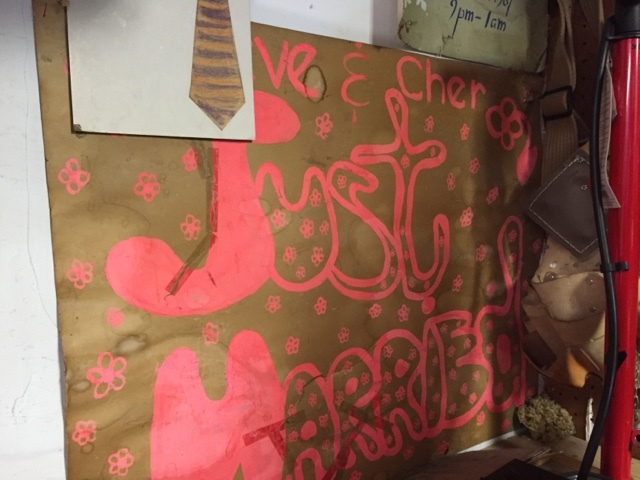 The sign I made for his getaway car for his 1969 wedding to Cheryl still hangs in his garage. 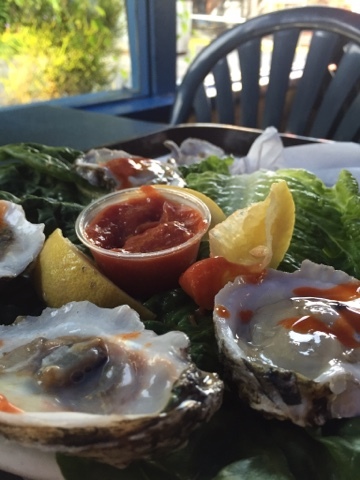 It was so nice to talk with old friends and also breathe in some cooler, beach air. I wish I would have remembered to take a photo of the 4 of us. 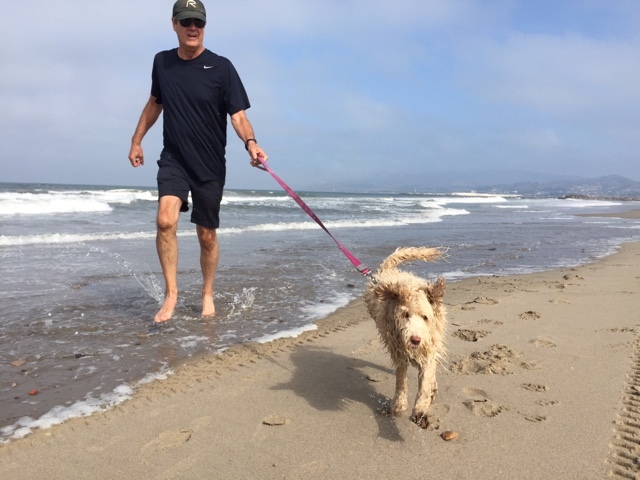 Martha enjoyed running on the beach and romping in the water. 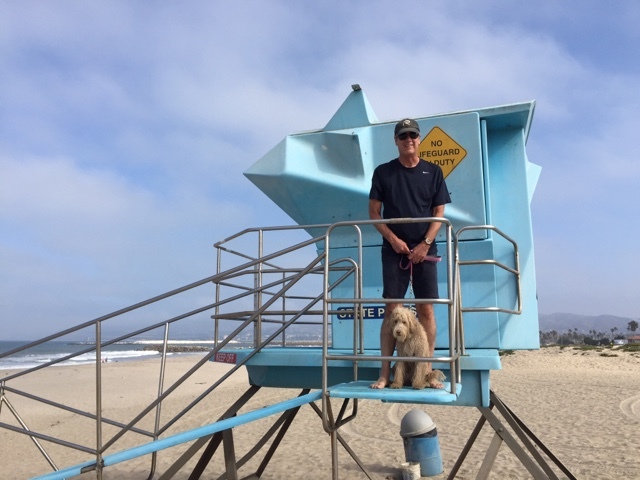 Dogs are welcome on all the Ventura beaches as long as they are on leash. She wanted to try her skills at lifeguarding. Martha was so good at the dog friendly restaurant. She just sat under the table and took a nap while we ate a traditional dinner of oysters and fish and chips. 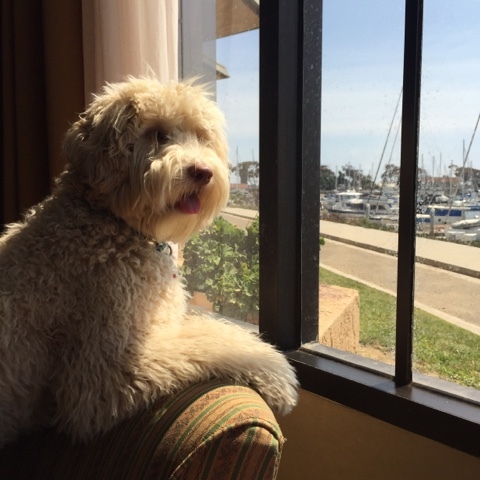 I think her favorite thing was looking out the window of our hotel room and watching the people go by. 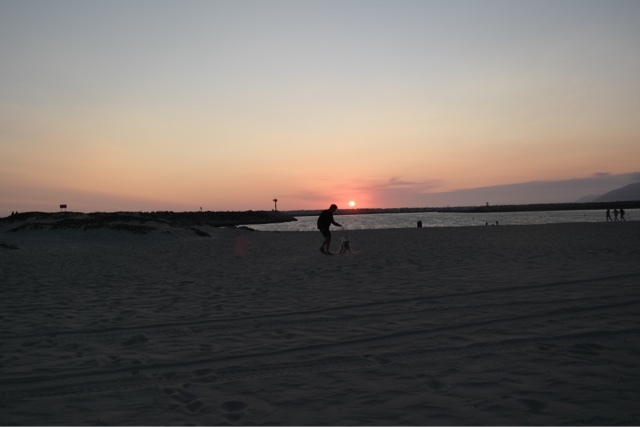 We stayed at the beach until sunset in hopes that I would get some good photos of my recent quilt finish. 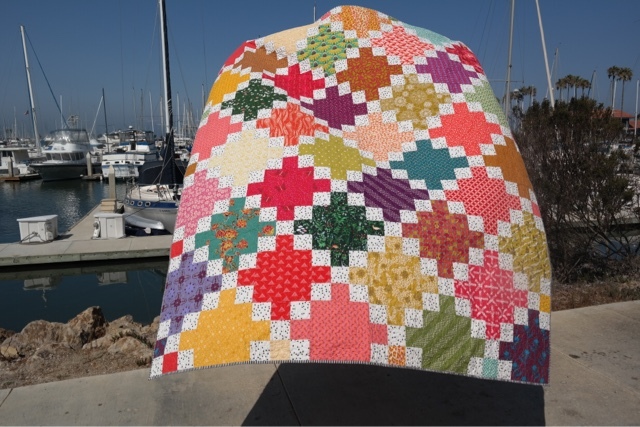 I am constantly searching for new places to take quilt photos but I often forget the beach is always windy in the evenings. This was the result of our first attempt to take good photos. Not only was it too windy, but we had already lost our light. The next day we took more photos in the harbor. Still windy but beautifully lit. 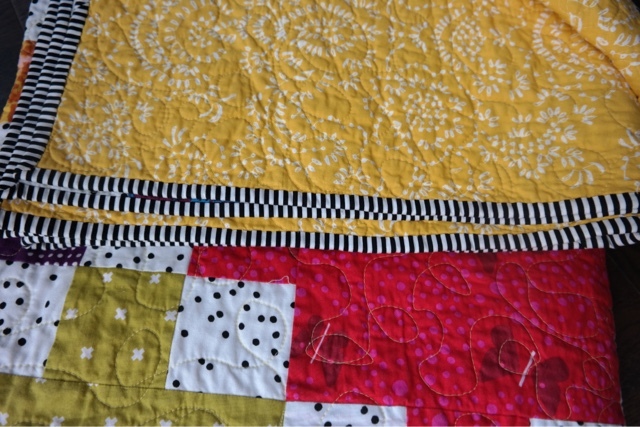 My favorite thing about this quilt is the dottie background and striped binding. I made this quilt for my friend's 60th birthday, coming up next month. It was super easy. The hardest part was laying out the entire quilt before you can sew even one block. I had everything cut and ready to go when I went to retreat in April. All I had to do was lay it out and sew each 9 patch together. The solid blocks were all ready to go. There are several patterns for this quilt. Single Irish Chain on Red Pepper Quilts blog, was my inspiration. I made 9" finished blocks. It's also known as a Garden Lattice pattern. I used a lot of AMH prints along with some Lizzy House, Cotton and Steel and other prints from stash. For the background fabric I chose Alison Glass's Seed Bead in black and white from her Abacus line. I love that yellow print IKEA duvet cover I used for the backing. It was a perfect compliment to all the prints. Using the duvet cover is a real $$ saver. You basically get two one piece backings for 20 dollars. I think the finishing touch is the striped binding by Timeless Treasures. I quilted this one on my Bernina 820 successfully using the BSR foot. I just did a loopy meander free motion quilting pattern. Very improv :-)) This was only my second time using the BSR. After having my machine for 5 years I am finally getting the hang of this attachment. I really think it is the thread. My Bernina hates Aurifil thread for quilting. I know that is probably not the correct thing to say online, but once I changed thread a lot of my problems went out the window. Aurifil makes a good product but it is not for every machine and every quilter. Fabrics used: all prints from stash. Background print Abacus Seed Bead in black and white. Binding: Timeless Treasures black and white stripe. This quilt is another finish on my third quarter Finish-a-long list.